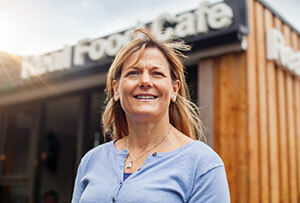 Hear from the award-winning food entrepreneur at MT's Inspiring Women Edinburgh conference. It was always a dream of mine to own my own business and work for myself. I had so many ideas I wanted to try out. For all kinds of reasons, in 2004 the time seemed right to take the plunge and so with the support of my late husband we set about creating a business and turning it into reality. I knew that location was key for a food and beverage retail outlet and I knew also that I didn’t want to stay in the ‘pub’ trade. I wanted to develop an eating concept that did not rely on trained chefs as I am not a commercial kitchen chef myself - we didn’t want to end up chef-less if they upped and left! We loved the outdoors and had a holiday house in Killin so when we spotted a derelict Little Chef for sale in Tyndrum, we had to take a look. How difficult is it to run a business in a very rural area? Running a rural business is very challenging. We dramatically underestimated the effect of seasonality on cashflow and of gearing up and down at the beginning and end of every season. Hiring staff, accommodating staff, finding suppliers for goods and services are all much harder in an out of the way location than in a central one. We are lucky enough to live in a beautiful location especially if you enjoy the outdoors, but doing business remotely is costly and adds layers of complexity that we certainly underestimated. What is the biggest challenge you have overcome personally and how did you do it? The biggest challenges that I have faced since opening the business have been personal in nature. These have ranged from coping with extreme grief and shock, to low self-esteem and self-worth issues, and when my Dad became ill, nursing him until he died. All these issues have hampered my ability to make good business decisions and deal with problems that inevitably come along in the running of any business. To make matters worse, I found that when I was in a ‘bad’ place, I often made ‘bad’ decisions and attracted ‘bad’ things to happen to me or at the cafe. It was like I was a victim in a downward spiral. The way I got better was by facing my problems and asking for help. It was scary at first. Once I started to recover and get stronger my decision making improved. As this happened, life and the business became more of a virtuous circle, reversing the downward spiral and leading to a happier, healthier version of me and better business performance. I now make my health and fitness my number one priority, above everything else in life. If I lose my health, then as I have found, I wont be able to give my best to everyone and everything that needs a bit of me! What are the biggest challenges facing women in business today? 1. Self-belief – I have found generally that men are much better at selling themselves and telling you that they can do things. Woman invariably don’t do this, they undersell themselves. 2. Children – Some employers discriminate against women of childbearing age, and even if they don’t there are practical issues around child birth and child care which are real practical problems faced by millions of working mothers. 3. Menopause – Woman going through the menopause are not sick but their whole bodies are changing. Very often they are suffering from sleep deprivation and radical hormone changes and they are expected to perform as well as ever. Hear more from Sarah Heward at MT's Inspiring Women conference in Edinburgh on 17 March.